Everyone counts at St. Paul. Everyone matters. No exceptions. It’s one thing to post the word “welcome” on a sign. It’s another thing to live it honestly. We try our best to be a church of honest and open welcoming. Even if you don’t feel completely at ease walking through another church door, you’ll find plenty of genuine hospitality at St. Paul. We’re a church with one Christ-centered heart. So we can afford to be of more than one mind (two? three? 3,500?). At St. Paul, we believe that living in a community with differences is the better way. We trust the Greek meaning of Acts 10:34, that God “makes no distinction between faces.” This means that all of the dividing up of people into categories – an exercise with which we are all familiar – cannot impress God. We live to embrace and delight in the variety of all people and their experiences. Living with diversity is a mark of discipleship here. It’s the way Jesus intended it. It’s one true mark of love. 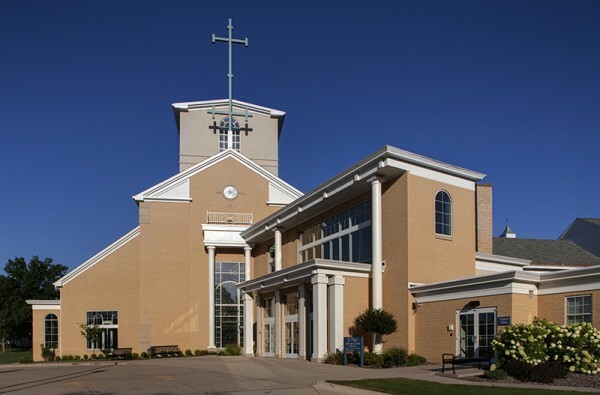 St. Paul is one of nearly 10,000 Lutheran Christian congregations of the Evangelical Lutheran Church in America (ELCA). Through this ministry partnership, we’re linked with churches, colleges, and faith institutions across America. Our mission commitments reach around the world. We speak openly about the stewardship of life at St. Paul. You’ll notice how many people commit themselves to the Lord in very generous ways. We give of our financial resources. We step up to serve. Some have time to volunteer regularly, others periodically. Every gift of time, energy, and financial support is motivated by a basic love — for a ministry that is faithful to Jesus Christ. You’ll sense a “vibe” here. It’s our contagious spirit, committed to needs beyond our own. At St. Paul, we believe beauty is more than skin deep. You won’t find our lives untouched by sin or untarnished by suffering. But you will find people with the love of Christ deep in their hearts. That’s what holds us together. Come and see.